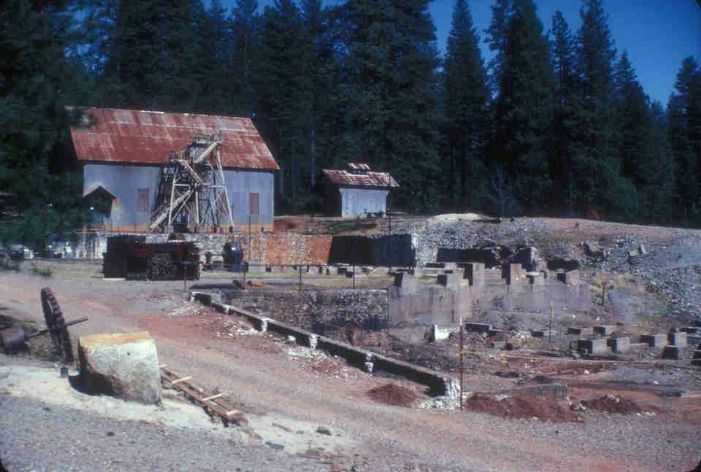 The Empire Mine in Grass Valley, Nevada County, was one of the richest gold mines in California. Grass Valley was only a small town, a mining settlement of 4 or 5 thousand inhabitants in the foothills of the Sierra Nevada mountains. There were many Cornishmen among the workers there, including Richard Trathen, a Cornish exile from Pendeen. Richard lived at 429 Auburn, Grass Valley, where he settled after leaving Cornwall in September 1907, looking for work. On June 5th 1917 all men aged from 21 to 31 were required to register for the draft and Richard duly completed his registration. He pleaded for exemption on the grounds that he was supporting a sickly wife and child in England. Perhaps recent news had influenced that plea, for on June 7th the Cornishman newspaper published a report that his brother James had been killed whilst serving in the Devonshire regiment in France on 9th May. Had word already reached Richard? On 17th September the local paper listed the first 39 men from Nevada County to be called up. Richard's name was there and, on September 22nd 1917, he was one of seven reporting to his local draft board. Among the 39 were a Kneebone, a Semmens and a Nankervis, so he may have had some Cornish companions, initially at least. Richard was born in Pendeen on 20th July 1887, the fifth child of Thomas, a miner, and Mary Ann. By the time Richard was 6 years old he had lost both his older sisters, who died at the ages of 5 and 11 years. Richard’s father was a tin miner, and by 1901 Richard and his older brothers, Edwin and William, had joined their father down the mines. By now Richard also had two younger brothers, Stephen and James, and a younger sister Mary Anne. Their father was to live only four more years. On 18th September 1907, at the age of 20, Richard married 21 year old Janie (Elizabeth Jane Wallis) at St Just church, and the entire wedding party headed off to celebrate in St Ives for the day. The following day Richard left for Arizona, according to The Cornishman. Whether he ever got there or not he was in California before the year was out. Nine months later, on 5th June 1908, Richard and Janie's son Stephen was born. The choice of name is obviously significant, as only three days earlier, Richard's 19 year old brother Stephen had been killed in an accident at Levant mine, along with another boy, Joseph Matthews, aged 17. They had been working with Richard's oldest brother Edwin, when a large slab had fallen from the hanging wall and crushed both boys. A few months later their mother also died and James and Mary Anne went to live with Edwin's family in Bojewyan. William was also married but was now working in South Africa, his family also living in Bojewyan. Richard's group of recruits travelled to Camp Lewis in Washington State to join the 91st Division, nicknamed the 'Wild West Division’, for training. 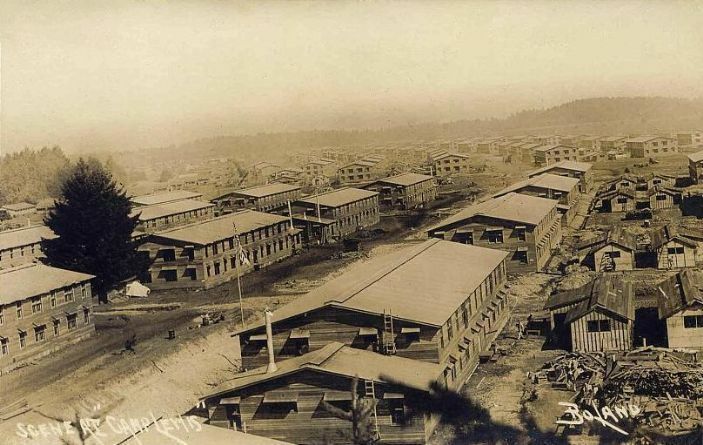 The camp was newly completed, having opened earlier in September with over 1,400 new buildings constructed since mid-June, Camp Lewis was now a city of over 50,000 inhabitants. Recruits learned close drill, military traditions, bayonet and hand-to-hand combat; they trained on the rifle and machine gun ranges, engaged in mock battles in trenches on the Camp Lewis training areas, and experienced gas attacks in specially constructed rooms. When the 27,000 men of the U.S. 91st Division moved out of Camp Lewis in June 1918, Richard was officially Private 2264051 in the 363rd Infantry Regiment. The division travelled by train, passing through Canada to Camp Merritt, New Jersey, arriving on 26th & 27th June. At Camp Merritt the men received new outfits, including steel helmets and trench boots, and had their final medical examinations. On 6th July the men were woken early and ferried to the troopships which were to carry them to Europe. It was not a comfortable journey: they were crammed into every available space, and the voyage took twelve days due to the zig-zag route taken to avoid submarines. They docked in Liverpool, Glasgow and Southampton, spent about a month in Britain, and then shipped to France in August to undergo their final month’s training. The division's first combat engagement came with the Meuse-Argonne offensive, launched on September 25. The offensive broke through the German lines, with the Ninety-First performing exceptionally well. On October 4th the division stood down, and 12 days later fought in one of the final conflicts of the war, the Battle of Flanders in Belgium. The Ninety-First Division had an outstanding record, capturing 2,300 German prisoners, 400 machine guns, and a large number of field guns and tanks. This came with a loss of 1,100 killed in action or missing. We do not have details of Richard's experience of the war, but we do know that he survived, although wounded in action, as he was awarded the Purple Heart. Richard was demobbed on 28th January 1919 and returned to Grass Valley and mining. In April, his wife Janie and son Stephen were able to join him, transported to the United States as ‘soldier's family’ on the USS Plattsburg. In October 1919, mining claimed the life of another of Richard's brothers: Edwin, who died, along with 30 others, in the infamous Levant Man-Engine disaster. Richard and Janie had 3 further sons: William Richard in 1921, James Henry 'Jim' in 1925 and Charles Wallis 'Wally' in 1928. The eldest, Stephen, and William, worked with him in the Empire Mine. Stephen married and, for a time, lived next door to his parents in Grass Valley. William served in the U.S. Marines throughout the USA's emgagement in World War 2. Richard and Janie and their families lived out their lives in California – Richard died in 1949 and Janie in 1952, William in 1982, Stephen in 1996, Wally in 2003 and Jim in 2007.